Winter weddings are exquisite affairs - there is something magical about having a wedding amidst the natural beauty of an all-white winter. 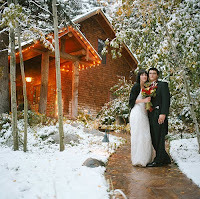 Imagine having a wonderful wedding reception indoors while there is pristine white snow on the ground outside. Something for the romantics indeed. 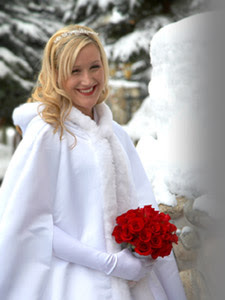 But winter wedding make-up should be different from the make-up you would ordinarily use at a wedding at other times. 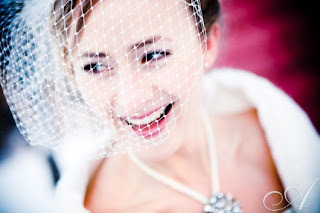 The natural look for bridal make-up is one that works best for winter weddings. If you are very pale, then do use a bronzer to be brushed over the face after foundation is applied. If your skin tone is warm consider gold, bronze, toffee and cocoa shades for your eyes. Other bridal make-up ideas would be to go for cool colors: for eyes choose silvers, gray, pewter and mushroom shades; for the lips use raspberry reds, rose-pink shades or burgundies. Winter weddings have different needs and requirements to summer ones and it does not make sense to expect them to look the same. Firstly, the scenery will look different in winter. Instead of the soft shades of summer the scenery will be much stronger with bold contrasts. Often in the winter the sky looks almost white and the bare trees almost black in contrast. Evergreens are present and the grass and hedges will appear darker in winter. Obviously the weather will be much colder and consideration must be given to some sort of cover-up for the bride whether it be a velvet cloak, fur shrug or shawl or thick lace bolero. Her gown will need to be made of heavy, luxurious fabric for warmth. If you are getting married in winter you may wish to think outside traditional bridal colours and consider some colour in your wedding dress, whether it's just in the embroidery, the bodice or from top to toe. Deep reds, burgundies, purples and evergreens can look striking against a winter background. If you want to be more traditional and marry in white, consider these colours for the bridesmaids, men's ties or cravats, flowers and other decorations. Much consideration needs to be made to your bridal make-up. In winter your skin and that of your bridesmaids is likely to be lighter. The natural lighting will usually be dimmer than summertime and you will need a slightly more striking make-up look rather than a light summery one if you are to look your most beautiful on the day and in the photographs. Make sure your foundation is as near to your own colouring as possible. It should even out your skin tone and keep your face looking fresh and youthful but should not turn you orange! If you are very pale a natural shade of bronzer can be brushed over the entire face after the foundation has been set with loose powder. If your skin tone is warm consider gold, bronze, toffee and cocoa shades for your eyes. Your cheeks will need a blusher with a warm tone. Although a light peachy shade might work in the summer, go for something with a little more depth for winter, such as a deeper coral or nutmeg. For your lips try a striking terracotta, cinnamon or warm red but if you feel these are too heavy for your colouring and bridal look go for a more subtle, sheer coral or copper. If your skin tone is cool you will need less of a golden look and more of the cool tones. For eyes choose silvers, grey, pewter and mushroom shades. Your blusher will need to be a medium to deep pink or mauve unless you are very fair and then a delicate pink will work. For the lips again the look needs to be cool so try raspberry reds, rose-pink shades or burgundies. To ensure your bridal make-up is perfect for you, for the time of year and to compliment the overall look of your outfit, why not visit a style consultant for a try out. They will be able to advise you expertly and make sure you are thrilled with your look for your big day. Beth Price is a senior image consultant with ColourMeBeautiful. Based in Ross-on-Wye, Herefordshire, Beth offers advice on all aspects of bridal image including colour analysis, bridal style consultations and bridal make-up. ColourMeBeautiful services make excellent Christmas presents for women particularly brides-to-be! Wedding and Bridal Makeup and jewelry designs. Entire life Replacement is a thing that you barely find, any time you buy facebook fanpage ratings Just a handful of great suppliers offer this. Social Media is that the best and straightforward Platform to unfold your voice and news everywhere the planet. and that we square measure providing best packages for it buy usa likes.